All good things come to an end, and this last 10 days we’ve had plenty of good things. 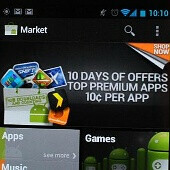 Good and cheap - Google has been celebrating 10 billion downloads on the Android Market. That was the exact occasion why it has been slashing prices on some of the finest apps on its app catalog 10 days in a row. So, this means it’s time to look back at all the awesome apps Google has offered so far - which ones did you get and which ones did you like the most? Don’t hesitate to share with us in the comments below. First. Meh, none of them looked that good to me anyhow. Although I couldn't pass up Minecraft and a few others. Plus the App Store has FREE apps specials. Wait,,,,,, You actually have an android? No kidding. The App Store has free specials Every day, and the apps are a lot better. Not to mention a lot of Android Market apps are malware and viruses. Promo Fail. c.hack you went from making sense some of the time to full on trolling... Your posts are so boring now. malware and viruses??? Never had one of those. funny cos android has more free apps than the app store. Yeah - viruses and malware are usually free. The rest are free out of desperation because nobody will pay for them. And all the free apps are crappy/virus/malwares? Well the last day of this and I am finally getting my GS2 today. Oh well. just buy them from the Market site and you can download them when your Galaxy S II gets here.